Despite an obvious lower attendance due to the storms back east, NADA 2018 has already proven to be a success for Sharp Performance! Sharp Performance USA is a leading manufacturer of promotional gifts specializing in auto dealers and has manufacturing roots dating back to the early 1970s. Sharp focuses on providing the highest quality promotional products to compliment our clients’ brand image and quality. We don’t play games to get business, we simply focus on consistently providing the best quality product, at highly competitive prices, with fast and reasonable lead times. Our specialty is branding our clients so they can focus on what they do best, sell and service vehicles. The weather back east was a huge issue this year and due to this, show traffic was noticeably light. We even had issues getting our own people here from the CT office. Regardless of attendance, we would consider this years show to be a success. Just three days after the show, we have had an increase of inbound product inquiries of 500% over the previous year. We haven’t even had time to follow up on our new outbound leads, which is a great temporary problem to have. NADA is always a fantastic opportunity for us to not only meet new potential clients, but to also meet our most treasured long term clients / friends. Many of our clients have had the same people handling their account for 25-30 years! Great patriotic way of drawing attention to your lots! 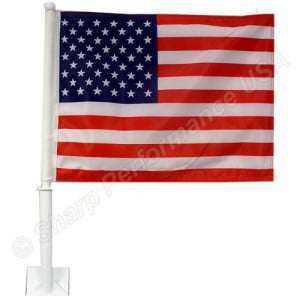 Car Window Flags – Great patriotic way of drawing attention to your lots! Does your dealership evoke positive feelings and thoughts in the minds of your potential customers when they drive by? Why not associate your dealership and brand with the symbol of freedom that unites us all? Give your dealership a patriotic boost by adorning your inventory with Old Glory in the form of 11”X14” car window flags. Made with high quality two-ply nylon, our flags are double stitched all the way around and mounted on a sturdy half-inch pole. With crisp, vivid colors these high quality flags will let everyone know you’re proud of your country in a distinguished manner. Built sturdy to withstand fading and fraying our flags look fantastic when customers drive by on the street, and they look just as good when they stroll through the lot looking at your inventory up close. Don’t detract from the beauty of a new car with a cheap looking faded flag that’s slumped over on the roof. Proudly compliment the look of your inventory with the bold red, white and blue colors of our country with a car window flag today! Our flags are in stock and available for immediate shipment from our Los Angeles area warehouse! 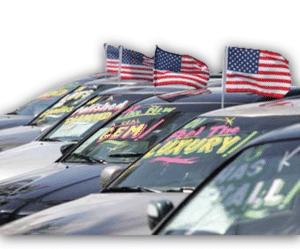 Car Window Flags bring attention to car lots! 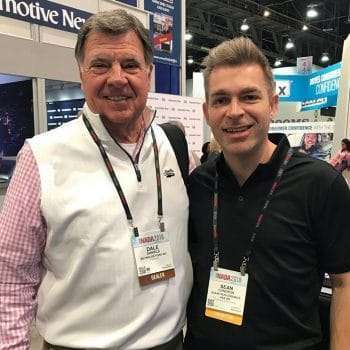 Sharp Performance USA Expands Sales Force in California and Connecticut! In April 2015 the owners of Medo Co decided to merge the Company’s US operations and businesses, including Pin Factory, into Sharp Performance USA Inc. There already existed common ownership between the two companies and the resultant entity entitled Sharp Performance USA Inc, brings significant operational efficiencies going forward. Sharp Performance Has Expanded West!